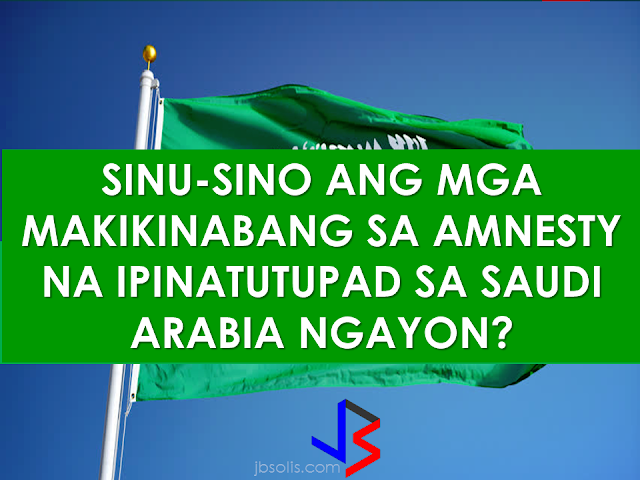 The Philippine government has pledged to repatriate some 5,000 overseas Filipino workers from Saudi Arabia. This comes days after the Saudi Government launched a new initiative to rid the country of illegal workers and residents. See 90-Day Amnesty For Illegal Workers In Saudi Arabia Starts. Read To See If You Are Qualified. A team of labor officials is on process to be deployed to Saudi Arabia as soon as possible. They will set-up three processing centers where OFWs can go to facilitate their repatriation while the 90-day amnesty is still in effect. These will be in Riyadh, Al Khobar and Jeddah. The group will be headed by POEA OIC Dominador Say, who is also the DOLE Undersecretary. As for the cost of repatriation, the Saudi Government made it clear that they will not shoulder the cost this time, unlike the amnesty program that was implemented in 2013. 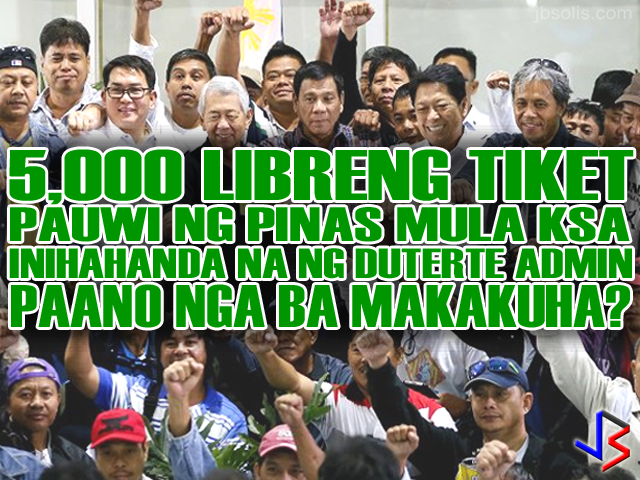 As such, the Duterte administration has pledged to pay for the plane tickets of OFWs who are qualified under the amnesty program. Anyone who wants to get a free ride home should register with the processing centers stated above. Also, DOLE and OWWA, along with the Local Employment Bureau, will provide livelihood assistance for the repatriated OFWs. The 90-day amnesty, which began March 29, covers undocumented workers with no or expired iqamas or residence permits; and those who escaped from or were abandoned by employers. 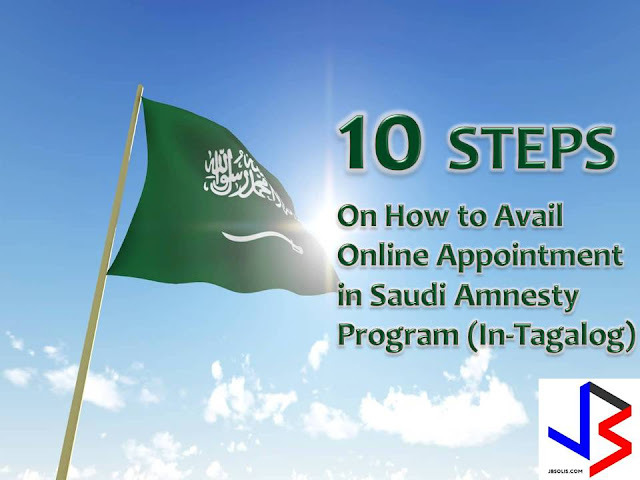 Overstaying individuals of Hajj, Umrah, or those with expired visit-visa holders are also included in the amnesty. The amnesty applications are free and there will be no jail sentences or monetary penalties to be paid. No objection certificates will also be waived and those who are approved will be given exit visas. 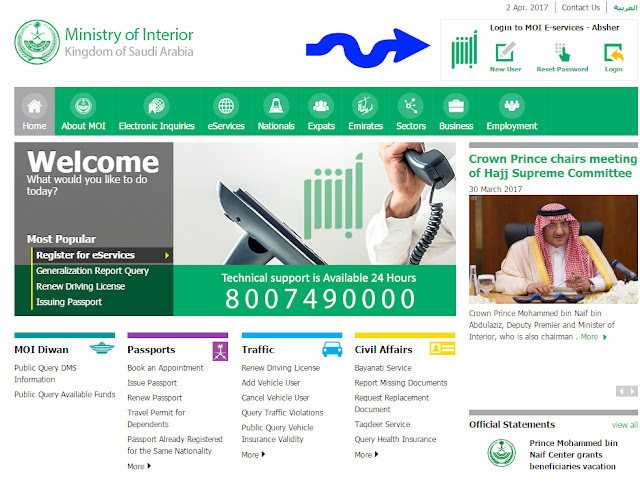 To avail of amnesty, holders of valid Passports and Travel Documents and know their Iqama numbers must apply for appointment online via the Ministry of Interior’s website. Those without travel documents or expired travel documents must go the the embassy first to secure a valid travel document before registering with the Ministry of Interior. The expatriate must leave the country before the deadline. 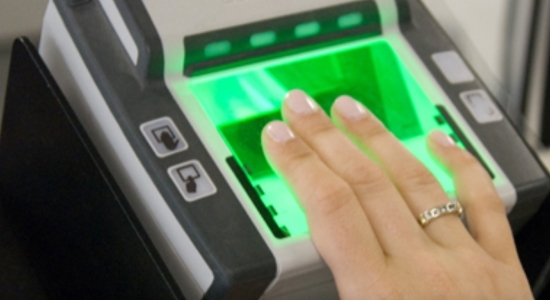 They will be exempted from the effects of the "Deportee Fingerprint System" which is a database of deported individuals. Persons listed in the database are banned from entering GCC Countries for a given amount of time. However, undocumented OFWs who have pending police cases or warrants, unpaid traffic violations, and bank obligations cannot avail of the amnesty. Those who will be caught after the 90-day amnesty will be subject to prison sentence, a fine of up to SR100,000 and deportation.